We are a non-profit group in the San Gabriel Valley that harvests extra fruit from homeowners’ trees and donates it to local food banks. Fruit For All has formed relationships with many people since my family and friends started picking fruit in 2010. Some of our homeowners have called us three or four times to harvest their trees. After my brother headed off to college, I wanted to ensure a harvest organization would be here to help our loyal customers. Food Forward is the perfect answer. The folks at Food Forward share our philosophy and our work ethic, and we feel Fruit For All loyalists will be in good hands in the coming years with Food Forward. Like Fruit For All, Food Forward is a non-profit, volunteer-powered group that picks fruit and donates 100% of it to local food pantries. 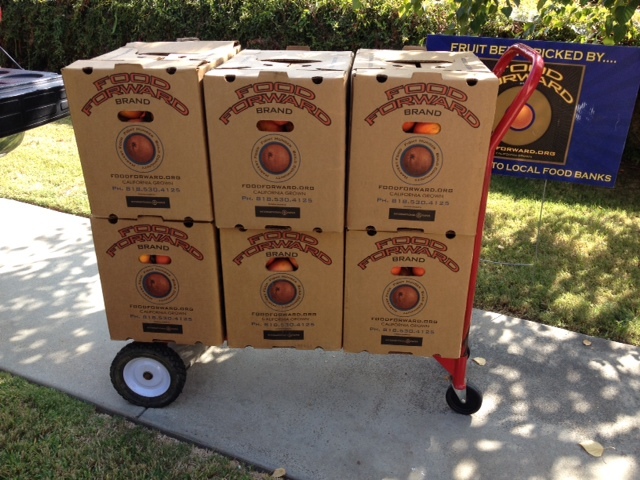 Fruit picked in San Gabriel Valley will primarily go to SGV food banks and pantries. Call Food Forward at 818-530-4125 or visit its website http://foodforward.org and click on the “Get Involved” and then “Property Owners” tabs to register your tree. Food Forward is fully insured and all property owners receive a tax deduction for every pound harvested. In addition, on the website, you’ll see how easy it is to sign up to join one of our picks. Select the “Events” tab and look for a pick in the San Gabriel Valley and join us. On October 12, 2011, Zach Selby, co-founder of Fruit For All, was recognized as an Unsung Hero of Los Angeles. The California Community Foundation and The Eisner Foundation recently honored Zach Selby for his extraordinary philanthropy to the community at the 2011 Unsung Heroes of Los Angeles Awards, an event celebrating the power and impact of philanthropy in Los Angeles. Selby received The Unsung Heroes of Los Angeles Awards to Extraordinary Individuals. Pictures and video footage from the ceremony are available at www.calfund.org/unsungheroes. I am Founder and CEO of PUENTE Learning Center. This morning I learned about your project from my sister who lives in Arcadia. She said that the two students who stopped by her home were “terrific” and represented your organization very well. Through my Center I have made many contacts and may be able to help in some way. Please keep me posted on your project. Question……how do high school students get involved? Thank you for helping life to be a little better for others. Thanks for your great comments, Sister Jennie! To answer your question, high school students can get involved through email, this website, or by giving us a call. Since we are a non-profit, we keep track of their service hours and give them a record of their work. Our biggest need is finding homeowners with trees and then getting volunteers to pick them! I saw your website on a passage with you in it!! I’d like to donate. I have a whole tree of excess oranges. How do I donate? I don’t see a phone number here? Hello Jennifer. Our phone number is 626-359-6666 or you can email us at fruitforallkids@gmail.com. Whichever is better for you. Do you have a contact for San Marcos, CA 92078? I have 2 orange trees and one lemon tree full of fruit. Let me do some research and I’ll get back to you by email. We do sometimes work in Hacienda Heights, so I’ll see what might be available. Thanks for contacting us. I’ll be in touch. Hello Ms. Leonard. Thank you so much for the acknowledgment. It means a lot. I’d love to come pick your persimmons when they are ripe. Ventura County maybe be out of our realm though; but if you send me your address when your persimmons come ripe I will check. Just curious, how did you hear about our organization? We must be spreading the word if it is all the way out in Ventura! The persimmons are ripe! Yes, it’s a bit of a trek for you so I understand if you’re unable to come out. I heard of your organization through micro-documetaries.com who filmed your work. Contact me should you decide you need/want persimmons. The migrating birds and local crows are having a feast! Hi Sheryl Leonard, not sure if there’s any interest in making this or seeing if any schools would pick your persimmons and make this in home ec or for an afterschool project – but it is only persimmons & lemon juice and makes what kids call “Fruit Rollups” – just a thought. Many other recipes when you google too! Z, you are my hero! Zach, I had the television on for back ground noise and heard a little bit of your project and stopped what I was doing and sat down and watched the entire program. What a great project we don’t have much fruit in Springfield, Illinois. So is there any help I can give to you? If there is please let me know. i think this is a great idea do you know if there is anyone with a program like this in the inland empire? We were just look at our back yard at all the apples on the ground. Looking Great!! People helping others are just better! Thank you. It’s rewarding — and fun! Kudo’s Zach & coworkers & volunteers for doing such a needed community service where fruit that might’ve been wasted is now going to people who could use it as we all know times are tough in this economy. I learned about your organization by watching Live Life Win today on 5/11/13 which must be a repeat since others saw you on TV in May & August 2012 by reading comments. VERY MUCH WORTH REPEATING TO INSPIRE OTHERS TO DO WHATEVER THEY CAN TO HELP OTHERS OUT! I live in Dunstable, MA on the border of Southern New Hampshire in a rural town with vegetable & animal farms & even a working dairy farm. I even have a sizable veggie garden of my own. I am thinking of networking with others who have excess veggies/fruits & eggs to help out local soup kitchens. By attending local farmers markets I shall encourage people who have blemished veggies that they can’t sell and people who have fruit trees with “dropped fruit” to donate them as they can make breads/soups/pies/fruit purees to make lower calorie breads etc. If I can just get a dozen to start, then more people will find out about this project too. I shall even visit the farm in Dracut, MA that allows people to grow in thier “community farm” and let them in on what they can do to help out local soup kitchens as well. I’ve also noticed the only school in our small town that only goes up to 4th. grade has a few raised garden beds with just weeds right now, so I shall ask local grocery stores & Home Depot & Lowes stores that sell building materials & veggies & herbs to donate a few plants each and see if the school will let me show some students how to prep, plant, weed & pick the veggies & herbs. If they will allow that, I’ll even ask to teach recipes with what the gardens produce as one of the things the kids would love is fresh salsa & maybe lasagna with “zuccini noodles” & stuffed tomatoes & stuffed peppers! Thanks so much for the inspiration as I am unemployed and have the time now to “give back” to my community! KEEP ON PICKING!!! So nice to hear teens do more than texting while driving – LOL! Thanks for the kudos. It sounds as if you have some wonderful ideas for your area. We have a group here in California that also runs a Farmers Market Recovery Program. They pick up all of the leftover, unwanted fruits and veggies at the end of the market and take it to food banks and soup kitchens. Many of the farmers don’t want to haul the remaining produce back to their farm and are happy to donate it, getting a receipt for a donation to a non-profit. You could definitely organize something like that in Massachusetts. Keep your ideas flowing. all it takes is one good thought to get the ball rolling to help other’s and will definitely take your idea and ask people at farmers markets to help out feeding those who are having a hard time by donating if they don’t want to haul thier unbought fruits & veggies back home!! Keep up the good work you all are doing, I am sure it’s appreciated. Hugs…..
Hello, I just watched a TV review of your work on “Live Life And Win” show. Very inspiring. Congratulations on the success of your hard work and perseverance! Prosperity in fortune and friends is your future. Thank you, Dan. It is a very rewarding endeavor. Hello I just happened to be browsing in search engines for donations of fruit and vegetables for my children school in Irvington NJ. We are trying to organize a back pack ( fruits, veggies, can goods) for students family in need. When I saw this link it caught my eye. I just wanted to say good job to you and helpers because every fruit counts and your work is priceless. We appreciate the compliment. Thanks. Your backpack idea sounds great. Good luck with organizing it. Your local food bank may be able to help. Hi, I am a volunteer Chinese translator, your story was in my assignment this week, in order to translate with understanding, i googled your name, and it led me to this website. I just wanted to say that your work is super inspiring and awesome, thanks for being such a nice person and bring your kindness to this world. Your comment definitely wins the prize for “farthest away”! Thank you so much for your encouragement. We will certainly keep up the good work since we all do what we can. Thanks. Great job Zach. I was move to tears by your story on Live life and Win. The world would be such an awesome place to live in, if we had more kids like you and your brother. Great Job. If we each do our part, you’re right, the world would be better off. I was inspired by my mom; maybe I can inspire someone, too. Thanks. It’s amazing how good a simple piece of fruit can make you feel. Keep up your good work. Lucky for you and lucky for us! Keep us in mind if you or your friends have extra fruit to harvest. it’s pleasant to read this blog, and I used to pay a visit this web site every day. Glad you like it. Spread the word. Wonderful, what a blog it is! This webpage gives helpful information to us, keep it up. Thanks for the compliments. It’s a challenge — that’s all I can say. But I am pleased that the blog seems to present our idea well. Thank you, Juanita. The work is truly rewarding, but your comment means the world. Thanks. Thank you, Ms. Lisa. That show was filmed a few years ago, and I am off to college, but my mother still picks fruit for a group called Food Forward. Everybody can pitch in. Fruit For All and Food Forward aren’t able to use olives, unfortunately. They have to be processed to be edible, and our goal is to harvest fruit that can be passed along directly to people who need food. You might check a local community college with a nutrition department. They might be interested in experimenting with your olives. Good luck. I just seen what your doing on TV I’m amazed and happy to see someone doing something like this on your own,free.You and all your other volunteers are an awesome inspiration.I just turned 49 and I realize I can get out and make a difference. GOD Bless all of you and thank you.I will keep y’all in my prayers.I like to tell people about Jesus and getting Saved. So if you or anyone you meet please Get Saved Be Free. GOD is real and you and your contribution ,as well as your other volunteers are proof of that.Thank y’all.sincerly Oliver Hensley Oxford Ohio. Thank you, Mr. Hensley. We all do what we can, don’t we? I think what u are doing is very beneficial. I wish I knew of some like you in the northeast of Pa. Your efforts are amazing. thank you so much and I hope your organization spreads state wide. God Bless you Zack. Thank you. I’m certain this kind of thing would work just about anywhere that has something growing. Check with your local food bank to see if it knows of anyone doing something similar. We appreciate the kind words. Thanks. Way to go! I work for a produce broker and we definitely have TONS of companies that are looking for homes for rejected product from retailers. Where are you located? What kind of supply chain do you currently have in place? If you ever need help on the trucking side we could definitely help there as well. I’ll talk to my manager and see if there is any way that we can collaborate. Thank you, Marilyn. We are in Southern California, near Pasadena. But, now, we work with Food Forward in LA County. If you have resources in this area, I’m certain the folks at Food Forward would like to hear about it. Its website is foodforward.org. Your awesome! This is what community is all about. As a person that grew up living off food banks and the kindness of others I can tell you what you do means so much. Now that I’m grown I volunteer with different groups and pay forward all the help that was given to me as a child. Thank You Thank you Thank you. Thanks for your “thanks” — what goes around comes around and I’m so glad to be part of the circle. You sound pretty awesome yourself. August 28th 2017 I just saw your organization on a show called Live, life Win! And I must say I’m very impressed with your organization of young people that are doing something so positive. You’re doing a great service to home owners and helping others in need of food, we have a lot of homeowners here in Jacksonville Florida that waste a lot of fruit by not picking it. Is it possible you can start an organization here as well in Florida? I personally don’t have the resources but would be willing to help. Hello, I definitely think a similar organization could work in Jacksonville, but we wouldn’t be able to start it. We’re just one family in Southern California. As the word gets out about Fruit For All and Food Forward, we hope others around the country will adopt our strategies. Thanks for your good wishes. My 4th grade group is reading your story. They think what you are doing is amazing. It has been a fun, rewarding project. Everyone can make a difference! Hi, I did a test and I heard about fruit for all, in 4th grade. I want to help because I am trying to grow mango and avocado tree, I also have a orange tree but the oranges are green and pretty small. That’s very cool that you followed up what you learned in a test and applied it to your own life. We are in southern California, but anyone can use their own fruit trees to help feed people who are hungry. When your fruit is ripe and ready, I’m sure you can pick it and donate it to your local food pantry or homeless shelter, where they can use the fruit. It takes almost a year for the little oranges to turn orange and become sweet and ripe. Don’t be fooled when they change color; it still takes a long time for them to become sweet. Happy gardening! Florida would be a great place for a local harvest group. You might check with your local food banks to see if they have any knowledge of similar organizations. Wow, that’s great news. Every little bit helps, and if everyone contributed as you and your students plan to do, our world will be better off. Good luck. And, thanks for letting us know. We don’t have franchises or anything, but with a little elbow grease and hope, anyone could contribute in this way. Good luck. If you live in the Los Angeles area, there are a number of food banks and relief agencies that distribute the fruit we pick. You have to apply at one of those agencies. Your local churches may know who to contact. Even if you’re outside the Los Angeles area, you should contact a relief agency or food bank in your community.